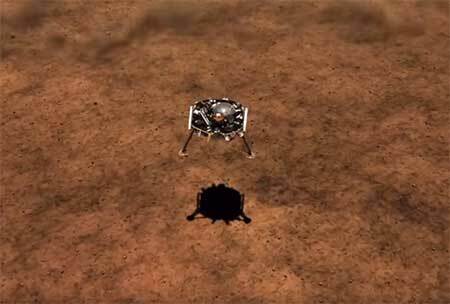 Washington State companies help InSight Lander nail Mars landing. Landing a spacecraft on Mars has been something of a hit and miss affair. The thin atmosphere inability to send commands in real time to correct problems means half of all missions have missed their mark, crashing into the surface. Small wonder engineers and support teams at two Washington State companies were holding their collective breath as the InSight Lander entered the famed seven minutes of terror between entry and landing. After waiting six months for the lander to make to reach Mars, the success of the mission all came down to them. Aerojet Rocketdyne in Redmond, Washington was the contractor for the 12 retro rockets that slowed the lander down to the point where it could set down slowly on the Martian soil. The company has built rockets that have propelled some of NASA’s most famous and successful missions, including the Curiosity mission which is currently exploring Mars. They’ve been through those famed seven minutes of terror several times, but a million things can go wrong between here and there, and no one ever knows for certain that everything is going to go according to plan as the craft slows from 12,000 mph upon entry to just 5 mph at touchdown. Before the rockets do their job, however, a mortar built at the General Dynamics Ordnance and Tactical Systems facility in Bothell, Washington had to fire correctly and on time, deploying the supersonic parachute designed specifically to slow the craft in the thin Martian atmosphere. The mortar is required to help the parachute inflate, since the Martian atmosphere in a hundred times thinner than earth’s. Without the parachute, Insight could not have slowed enough, even with Aerojet’s rockets. Part of the reason for the suspense is the delay in communications. It takes about four-minutes for communications to reach earth from Mars, so the mission can’t be tracked in real-time. It was a relief to everyone when InSight beamed back its first photo from the surface, confirming that the entry and landing went as planned. The feat is even more remarkable since each of these critical steps is automatic, programmed months before the mission launches. If any sequence failed to occur, the lander would have crashed in the Mars surface. The two companies share a common heritage in Washington State. They were once part of Rocket Research Company, which was founded in the 1960s as a Boeing aerospace spinoff. In 2001, General Dynamics purchased the company and split it in two. The rocket engine side of the business was eventually sold to Aerojet-Rocketdyne. Washington space companies continue new trails, from building the rockets that allow spacecraft to explore the heavens to a record launch of 64 satellites on a single mission, something Seattle-based Spaceflight accomplished on Dec. 3. Read more about General Dynamic’s role in the mission in The Seattle Times. Learn more about Aerojet-Rocketdyne’s part in the Insight mission in the Times.